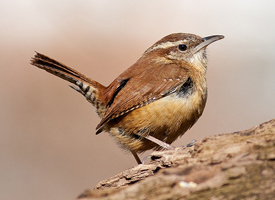 This morning, as I stood at the kitchen sink washing the apple and banana I planned to eat for breakfast, a Carolina Wren flew up and perched on the backdoor handrail. 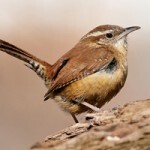 Only a few feet from me, it looked over the porch and surrounding area before flying off. I’ve thought back on that saying many times in recent years. While this modification of a quote attributed to Samuel Goldwyn seems simplistic, an examination of it yields a rather profound concept. For many people, criticism is simply not acceptable. While intellectually, one might profess to desire constructive criticism. One defines “constructive” in an extremely narrow context. At the Cola III workshop last night 6/12/12, we had four readings from novels in progress and major discussions about editors and editing. Three of our members plan to attend the workshop intensive in Rock Hill this Saturday. Gardening is such a blessing. 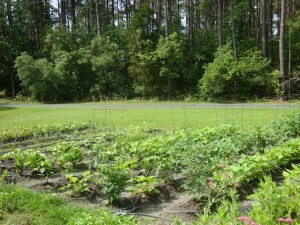 We’ve already harvested and eaten potatoes, carrots, onions, lettuce, cucumbers, and beans. Last week we canned five quarts of pickles. Today we canned five quarts of beans. I look forward to enjoying the bounty of the garden this winter. 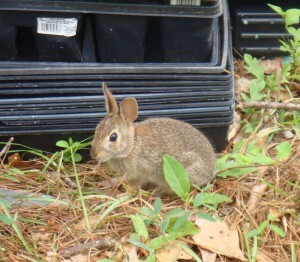 Each year a new baby rabbit finds a home near our garden. We always name him Petey. This is Petey number four or five.